Are Hotels Obsessed with Direct Bookings? From left to right: Marissa Brady of The Leading Hotels of the World (moderator), Trey Yost of SiteMinder, Gary Hawkins of Sydell Group, and Carlos Aquino of Tafer Hotels and Resorts. Hoteliers are debating the amount of focus that should be given to direct bookings. Recent PhocusWire articles, written by reporter Lisa Fox and Duetto’s Patrick Bosworth, presented opposing views about whether hotels should be “obsessed with direct bookings” in light of the increasing proliferation of OTAs in the customer acquisition funnel. 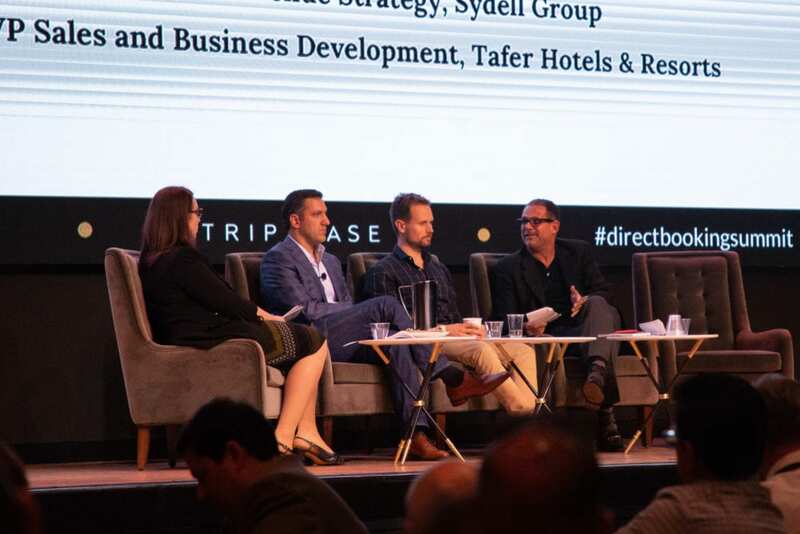 But discussions at Triptease’s Direct Booking Summit last week demonstrated that hoteliers are not obsessed with direct bookings. Or at least not with the same fervor as the vacation rental industry. For two days in Dallas, speakers and panels discussed high-level hotel industry topics for an audience primarily made up of independent hoteliers. Surprisingly, much of the discussion was around OTAs—not whether hoteliers should use them, as many VRMs are asking themselves, but how they should maximize their relationships with them. Third parties are here to stay. The clear statement was that OTAs and other third parties are here to stay, and hoteliers generally accept them as a standard and necessary part of their marketing mix. Many described using them as “being on the shelf.” In fact, when I asked hoteliers about their take on OTAs, every single one shrugged and described them as a necessary evil. Despite the sentiment, my (albeit limited) peek into the hotel world revealed a more collaborative approach to the OTA relationship. During a panel discussion on unlocking the potential of every acquisition channel, Sanovnik Destang, executive director of Bay Gardens Resort in Saint Lucia, shared that his properties currently get around 40 to 45 percent of their bookings directly, and his goal is to increase that to 60 percent. Both Destang and fellow panelist Dan Towvim, senior director of e-commerce at Sonesta, said they don’t want to reach 100 percent direct bookings because the OTAs deliver new customers they couldn’t otherwise reach. Direct bookings may not always be the best bookings. Several hoteliers mentioned their willingness to let some OTA guests continue to book through third-party sites. They weigh the costs of OTA commissions against the primary and secondary costs of direct bookings, including website and booking engine maintenance, marketing and revenue management staff salaries, loyalty program sales efforts, the cost of points used by loyalty program members, and others. Jay Hubbs, senior vice president of e-commerce for Remington Hotels, also cited hotels’ limited budgets and staff bandwidth. Kelsey Miller, corporate director of digital marketing at Woodside Hotel Group, noted cancellation rates as another factor to consider in evaluating acquisition model costs. Considering all these layers, it may make more financial sense for a hotel to not be so obsessed with direct bookings. Metasearch is holding its own in lodging. Metasearch was often lumped in with OTAs, but several sessions explored metasearch on its own. Where the function may still have shaky legs in the vacation rental industry, sites such as TripAdvisor and Google are more of a given on the hotel side. Flights-first metasearch Skyscanner recently added hotels, hostels, and apartments from OTAs like Expedia and Booking.com. During the metasearch in 2018 panel, moderator Nicholas Ward shared data showing a sharp rise in hotel competition on metasearch platforms over the past three months. Ward is the president and co-founder of Koddi, a metasearch and digital ad bid automation platform. He anticipates metasearch acquisition costs to increase with rising competition. Discussing Google in particular, Hubbs noted how the company is becoming more ubiquitous throughout the booking process. “Being on that shelf is arguably more important than being on other shelves right now,” he said. Hotels are welcoming Airbnb and finding early success on the platform. Also of note was the mention of Airbnb, and an informal audience poll showed that several hoteliers are using Airbnb successfully. “Airbnb is becoming a stealth OTA,” said Destang of Bay Gardens. Ryan MacDonald, director of revenue management and e-commerce for Palm Holdings, served with Destang on the panel on unlocking the potential of every acquisition channel. He echoed Destang and Towvim’s goal of using OTAs but then converting those guests to direct bookers. He reported that in Palm Holdings’ test of some properties on Airbnb, 70 percent of the guests booked from the site ultimately convert to direct bookings, including business travelers. In a later panel on how independent hotels can compete against large chains, all three panelists viewed Airbnb favorably. Carlos Aquino, vice president of sales and business development for Tafer Hotels and Resorts, said, “How Airbnb has positioned itself is how independents should position themselves—look at it as inspiration, rather than a threat.” Trey Yost, vice president for the Americas with SiteMinder, said his clients are embracing it as another tool and are finding it successful. Gary Hawkins, vice president of revenue strategy for Sydell Group, agreed that they had seen revenue from the site. “We welcome it,” said Hawkins. … but direct bookings still matter. Data: Data is the lifeblood of hotels, from costs to revenue to response time, and hotels dig into it incredibly deep. However, multiple speakers and panelists encouraged looking at data in different segmentations and with better visualization, suggesting that current analysis practices may not be keeping up. Silos: Operational silos appear to be an issue plaguing the industry, particularly with the lack of data sharing between marketing, sales, digital, and revenue management departments. Content: The “content is king” trope echoed on this side of the travel accommodations world, and just as in the vacation rental space, attendees were encouraged to leverage their strength in local, expert content on their properties and destinations. Guest experience and customer service: In another similarity to the vacation rental industry, guest experience and customer service are increasingly paramount in competing with third-party channels and winning repeat guests. This extends into survey and review responses, too. Throughout history he that controls his inventory wins….and always prevails. Varied brokers are short lived from antiques to real estate to travel agents to art dealers to head hunters to OTA’s. Rare that any broker can control enough attractive inventory to meet cyclical demand. Direct Booking will grow as brick/mortar catches up on technology thingees.